Lethal food combinations: Maintaining a pet on their normal food is always a good idea. Some foods, such as chocolate, may be poisonous to the pet. Feeding scraps may encourage inappropriate behavior such as begging. Changes in diet, such as table scraps can cause diarrhea or vomiting and thus make a holiday celebration less pleasant for all concerned. Chocolate contains theobromine and caffeine, both of which can be toxic to pets; vomiting, diarrhea, heart problems and death can occur if ingested. If your pet should get into chocolates, please call your veterinarian or a veterinary emergency hospital as soon as possible. Be prepared to tell them what your pet weighs, and how much of what type of chocolate the pet ingested. Baking chocolates and dark chocolates are more dangerous than white chocolate. Some pets can ingest a small amount of chocolate and be fine, other pets may develop vomiting, diarrhea, nervousness, hyperactivity, bloat and possibly death. Chocolates of any kind should not be given to pets. This includes things like chocolate chip cookies, chocolate covered peppermint patties, and other holiday foods and treats. Caffeine is found in many soft drinks and special holiday drinks, such as sweetened chocolate or coffee. These should not be given to pets. Fruit Cakes may contain rum or other alcohol. Alcohol poisoning is very dangerous to pets, causing a drop in body temperature, blood sugar and blood pressure. Rising bread dough can cause obstruction if ingested. The yeast can also result in alcohol poisoning in pets. Please keep bread dough, fruit cakes, rum raisin cookies and holiday treats of this sort well out of reach of pets. Reminding guests to refrain from sharing human food with your pets is always acceptable. Food products used in ornaments: Homemade ornaments, especially those made of play dough-type material or other salt-based products or food, can be extremely toxic to pets. The salt or play dough ornaments appeal to pets as a tasty treat because of the salt. However, an ingestion of a salt-based ornament can cause an animal’s death. Animals ingesting these types of ornaments need to be treated by a veterinarian for salt poisoning. Pets do not often take a bite out of glass ornaments but it has been known to occur. Pets can step on and break glass ornaments as well. Cuts to the mouth or pads of the foot may be painful and need a veterinarian’s attention to remove the glass and close the wound depending upon the severity of the cut. Holiday Hazards: Candles should not be placed where a pet could knock them over. Remember, cats often jump up and knock items off of a shelf or mantle, especially if it is in a location they are accustomed to occupying. A dancing flame can be interesting to felines who have been known to swipe at the flame. Burns may occur but fires may be a bigger danger in the home. Plants: Poinsettia plants and Christmas cactus are often considered the must-have Christmas plants of the season and can cause adverse reactions in pets. Animals that ingest these plants may experience gastric distress, such as vomiting and diarrhea. Generally this is self-limiting. The pet will often overcome this irritation within 24-48 hours. Provide small amounts of water but offer no food until the vomiting has stopped; this may help settle the stomach. It is always wise to consult your veterinarian anytime your pet has an upset stomach. Tinsel decorating a Christmas tree or wreath is shiny, lightweight and moves very easily, enticing playful cats. Ingested tinsel can lodge or anchor in the stomach, inhibiting passage through the intestines. It can also wrap around the base of the tongue and cause serious injury and impede the ability to eat or drink. Tinsel can actually cut tissue as the intestines contract. Yarn can behave in a similar fashion. 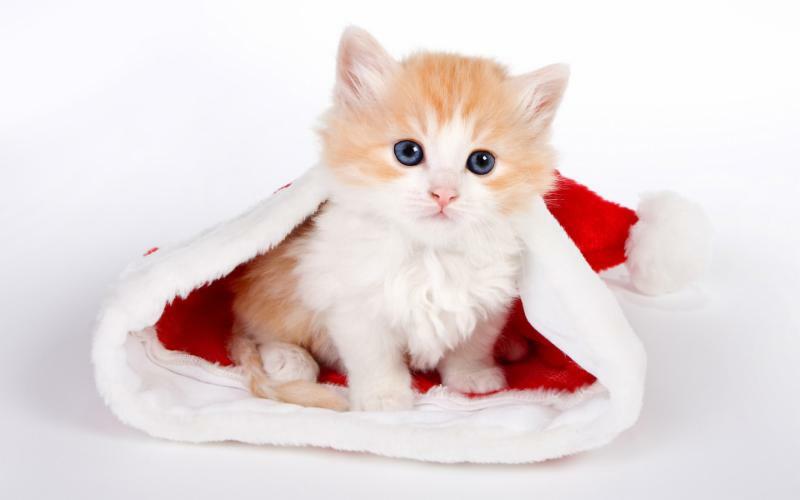 Both tinsel and yarn represent special hazards to felines. Holiday Perfumes: Holidays are often filled with guests and the desire to perfume the home. Liquid potpourris may be the choice for the perfume but can contain essential oils and cationic detergents which if consumed can cause chemical burns to the mouth, difficulty breathing, tremors and fever. Dogs may be affected but are not quite as sensitive to these chemicals as cats. Potpourris, whether liquid or dry, should be kept well out of the reach of pets. 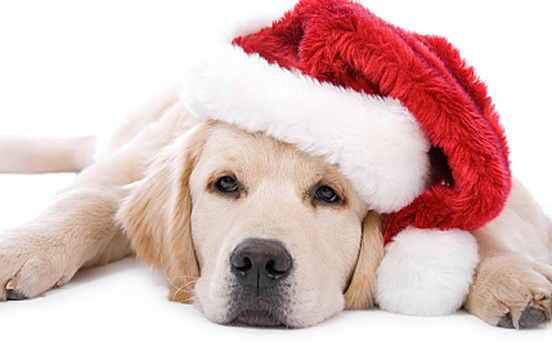 Watch for any signs of distress or changes in your pet’s behavior during this holiday season. An owner’s awareness of possibly harmful decorations and foods is the most effective way to reduce pet toxicity over the holiday. Following these simple guidelines will help make the holidays fun and safe for you and your pet(s)! We start answering phones at 8:00am during the week & at 9:00am on Saturdays. We are closed for all major holidays. This applies to boarding pick ups & drop offs. Food, Toys, Treats & More!